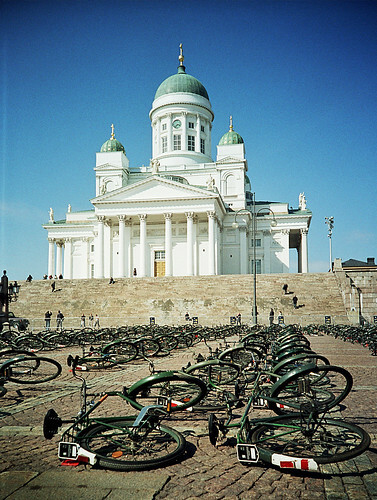 1000 Bikes - by Teppo on Flickr. Click here or on the photo to read what these bikes are all about. I'll speaking in Helsinki this Saturday [25 September 2010] at the Megapolis 2025 Festival. The festival's theme this year is Rhythms of the City. How appropriate to have the bicycle involved. Megapolis is an urban festival organized by the environmental NGO Dodo. Previous speakers have included former mayor of Bogotá Mr Enrique Peñalosa, author and journalist Carl Honoré, President of Finland Mrs Tarja Halonen and social media entrepreneur Mohamed El-Fatatry. And now some bicycle schmuck from Copenhagen. Apart from the talk there will be a bike event, meetings with city officials and journalists and a few visits to saunas, hopefully. The hotel has several! Cool!